I handed in graphic design1-2 products. 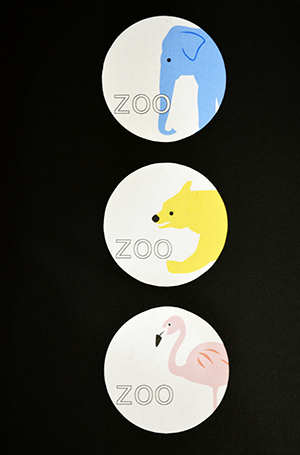 I choose elephant, bear and framingo as motif. This is the base design. There should be more space. Compare to other two, it is narrow. The viewpoint is from diagonally upward? Be conscious about the sense of unity. Small shapes in beak are not need. Need to abridge. This is a design in a coaster. 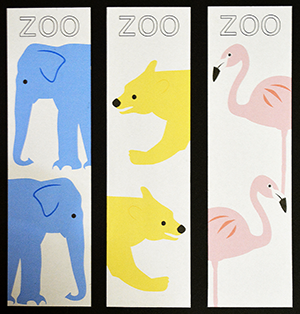 Do not pile up a word "zoo" and elephant motif. Need to "zoo" smaller and move more left. The color of left ear is not able to be seen. This is a design on a flag at a zoo. The end of upper motif's leg is unnatural. I did my best, and I used lots of time. But there are lots of comments.